Following the successful 2015 debut, CURRENT: Contemporary Art from Scotland will move into Phase Two at Shanghai Minsheng Art Museum in December 2016. Curated by Cooper Gallery DJCAD, University of Dundee in collaboration with Shanghai Minsheng Art Museum and organised in partnership with the British Council, Phase Two of CURRENT: Contemporary Art from Scotland focuses on the history, development and current conditions of artists’ moving image works to further explore the distinctiveness of contemporary art made in Scotland, its grass-roots spirit and its keen debates with the social and political dimensions of art and culture. Phase Two features two major group exhibitions REWIND: British Video Art in the 70s & 80s and >>FFWD: Moving Image from Scotland which will be previewed on Saturday 17 December 2016. Screening events will be held at major contemporary art venues K11 Art Village in Wuhan and the Red Brick Art Museum in Beijing. Excavating radical histories encapsulated in seminal British artists’ video works from the 1970s and 80s, REWIND provides an in-depth historical perspective with which to grasp the condition of the ‘contemporary’ as a moving image falling in and out of history. 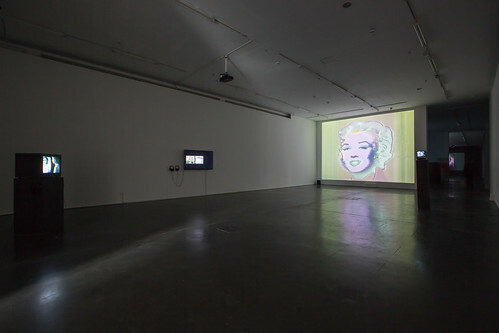 Drawn from the significant national AHRC research project led by scholars at Duncan of Jordanstone College of Art and Design, University of Dundee, the REWIND exhibition in CURRENT features works by pioneering video artists George Barber, David Critchley, Judith Goddard, David Hall, Steven Partridge and Elaine Shemilt. 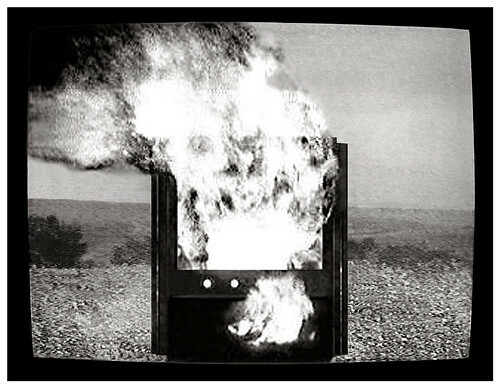 In the CURRENT project, REWIND provides insight into British Video Art as a critical and historical crux in the turns of contemporary artists’ moving image in the UK and internationally. Sampling the visual languages and formal innovations developed by video artists working during the 1970s and 80s, REWIND provides a telling account of how the image culture of the ‘contemporary’ is saturated with citations, quotations and references from its near past. Installation images of REWIND at Shanghai Minsheng Art Museum. Pushing at the boundaries of the video medium, the art works re-form seemingly accustomed images from television and popular culture, turning, stretching, concealing and layering them from the familiar into radical, alternative compositions. The REWIND exhibition will include David Hall’s ground-breaking TV Interruptions (1971) as a 7-part installation. Originally commissioned in 1971 by broadcasters STV for the Edinburgh Festival, TV Interruptions entailed the broadcast of 7 Interruptions by Hall on TV at unannounced times to an unsuspecting audience during the Festival period. Situating the moving image as information, documentation and as a visual language, the REWIND exhibition offers a reflective take on the artistic histories inscribed in the formats of video and Television, enabling these ground breaking art works to be seen against a global panorama of artist’s moving image practices. George Barber (born 1958, Guyana) is a critically acclaimed artist, living and working in London. He is the initiator of the widely celebrated technique ‘scratch video’ and his works are considered to be seminal in the history of Video Art in Britain. He has exhibited and screened his works widely in the UK and internationally at esteemed organisations including Tate Britain, Tate Modern, ICA, New York Film & Video Festival, Dundee Contemporary Arts, Miami Art Basel and La Rochelle Festival, France. He is frequently exhibited in commercial galleries including Seventeen, Kate Macgarry and Wilkinson Gallery in London. He is often cited by younger video artists as an influence and has recently gained renewed critical acclaim in contemporary art publications such as Frieze, Art Review and Art Monthly. His 2006 work Automotive Action Painting won First Prize at the 24th Hamburg International Short Film Festival in 2008 and Film & Video Umbrella released a monograph on his work in 2005. Barber is a graduate of Central St Martins and the Slade College of Art. David Critchley (born 1953) is an artist based in London. His work combines video, photography and installations and his video artworks have been screened widely in the UK, in Europe, North America and worldwide. His video works are distributed by LUX. At present his work Cradle to Grave is a permanent exhibit in the Wellcome Trust Gallery at the British Museum made in collaboration with Pharmacopoeia-art. Critchley was a central figure in the organisation of London Video Arts (now LUX: Artists’ Moving Image) from its inception in 1976. From 1986-1991, he formed and ran the video production company Greenstreet Ltd. In addition Critchley was one of the organisers of a now legendary series of installations and media performances at 2B Butler’s Wharf in the late 1970s. He studied at Stockport College, Newcastle Upon Tyne Polytechnic and the Royal College of Art, London. He taught video at the Slade College of Art, Chelsea College of Art and the School of Art at Croyden College and was a visiting lecturer at many UK art colleges in the late 70s and early 80s. Judith Goddard (b.1956) is an artist living and working in London. She began making videos in 1981. Associated with the second wave of video art in the UK, Goddard developed a rich visual style. She has an enduring interest in conceptual and visual perception, positioning the viewer as key to the work. Her work often employs a diverse range of historical and cultural references. Goddard’s work has been exhibited widely, with installations at Tate Liverpool, Centro Cultural de Belém, Lisbon; Centre D’art Contemporain, Paris; Whitechapel Gallery, London and Kettle’s Yard, Cambridge. Recent exhibitions and screenings include Rewind, Tate Modern, (2012); Rewind & Play, Light Box, Tate Britain, London (2010); The Undistributed Middle, South London Gallery (2012); Upside Down/Inside Out: ‘Helen’s Room’, Kettle’s Yard, Cambridge (2009); Analogue. Pioneering Artists’ Video from the UK, Canada and Poland (1968–88), Tate Britain, London (2006); Cross Town Traffic, Apee Jay Media Gallery, New Delhi (2005); Collage, Bloomberg Space, London (2004) and 100 Years of Artists Film and Video, Tate Britain, London (2004). Judith Goddard studied at the University of Reading and Royal College of Art, London, and has taught at the Rijksakademie, Amsterdam, and the Slade School of Art, London. David Hall (1937-2014) was an esteemed moving-image and installation artist. His contribution to British video art is unparalleled. He was a founding member of the video art movement in the UK in the early 1970s. His film and video single screen and installation work has been widely exhibited in the UK and internationally at many venues including Documenta Kassel, Tate Gallery London, Centre Georges Pompidou Paris, National Museum Reina Sofia Madrid and the Museum of Modern Art Vienna. His works are held in major international collections including Tate, London, Museum of Modern Art New York, Venice Biennale Archive, Calouste Gulbenkian Foundation, British Council, British Film Institute, Royal College of Art, Harvard University, ZKM Karlsruhe. He participated in the formation of the Artist Placement Group in 1966; co-organised the seminal international Video Show exhibition at the Serpentine Gallery, London in 1975; and was co-curator of the first video installations exhibition at Tate, London in 1976. In the same year he initiated and was a founding member of the artists’ organisation London Video Arts (now part of LUX). His first television interventions appeared on Scottish TV in 1971 and his first video installation was shown in London in 1972. Since then he made work for broadcast by BBC, Channel 4 TV, Scottish TV, Canal+ TV and MTV. A graduate of the Royal College of Art, London (1960-64), he taught at esteemed education organisations including the Royal College of Art, Central St Martin’s School of Art, Chelsea College of Art, San Francisco Art Institute, Nova Scotia College of Art. He introduced the term ‘time-based media’ through his writings in Studio International and elsewhere. Stephen Partridge (born 1953, Leicester, UK) is an artist and academic researcher based in Dundee, Scotland. He was in the landmark video shows of the 1970s including The Video Show, Serpentine Gallery (1975), The Installation Show , Tate (1976), The Paris Biennale (1977) and a solo exhibition at The Kitchen in New York (1979). During the 1980s he exhibited widely and was commissioned by Channel 4 television to produce Dialogue for Two Players (1984). His seminal artwork Monitor (1974) was acquired by TATE Britain in December 2014 and is on show in A Walk through 500 years of British Art till late 2016. Since 1976 he has lectured in a number of art colleges, and in 1992 established the School of Television & Imaging at Duncan of Jordanstone College of Art & Design (University of Dundee). He is Professor of Media Art and Associate Dean of Research. He is the principal investigator on the research projects REWIND and REWINDItalia which have been awarded successive grants from the AHRC, and the Royal Society of Edinburgh. Currently he is co-investigator on the AHRC-funded European Women's Video Art (EWVA) research project, led by his colleague Prof. Elaine Shemilt. Elaine Shemilt is an artist and researcher, based in Dundee, Scotland. Her art work ranges across a wide variety of media including print-making, video and installation. In the early 1970s, she was a pioneer of early feminist video and multi-media installation work. She has exhibited internationally including Switzerland, Denmark, Holland, Canada, USA, Australia, Italy and Germany including the Hayward and the Institute of Contemporary Art, London; and the Edinburgh Festival. Selected exhibitions include the Video Show, Serpentine Gallery (1975), Hayward Annual, Hayward Gallery, London (1979), Traces of Conflict: The Falklands Revisited 1982-2002, Imperial War Museum (2002). Recently she has collaborated with the video artist Stephen Partridge on a number of installations, including Rush, Fieldgate Gallery,London and Quattro Minuti di Mezzogiorno exhibited at Limiti Inchiusi Arte Contemporanea, Campobasso, Molise, Italy (Dec 2010-Jan 2011). She is a graduate of Winchester School of Art and the Royal College of Art. In 1988 she established the Fine Art Printmaking Department at Duncan of Jordanstone College of Art and Design (University of Dundee) was Course Director of Printmaking from 1988-2001. She is currently Professor of Fine Art Printmaking. Shemilt is a Fellow of the Royal Society of Arts (2000) and the Royal Geographical Society (2009). In 2002 she was made a Shackleton Scholar and awarded a Carnegie Scholarship. Shemilt is the Artistic Director of the Centre for remote Environments at the University of Dundee and the Vice Chair of the South Georgia Heritage Trust. Phase Two of CURRENT | Contemporary Art from Scotland is a collaboration between Shanghai Minsheng Art Museum and Cooper Gallery, Duncan of Jordanstone College of Art and Design, University of Dundee and organised in partnership with the British Council. CURRENT | Contemporary Art from Scotland is kindly supported by the British Council, China-UK Connections through Culture, The National Lottery through Creative Scotland, Scottish Government, Shanghai International Culture Association and LUX Scotland. CURRENT is a direct result of the Research and Development Trip (January 2014) funded by Creative Scotland. IMAGE: David Hall, TV Interuptions, 1970. Courtesy REWIND and the artist's Estate.